Hive’s mission is to contribute to the world by creating everyday products naturally better. You don't rock a cowboy hat or race cars (that we know of), so what makes you guys similar to Paul Newman? Just like Paul Newman we are just trying to make a small difference in the way people interact and perceive business, and in the process create really good products that people love. What’s worse: going on a date with really chapped lips or going to the beach and finding no waves? No waves is much worse, at least with chapped lips you can do something about it. We know there’s a good heart in you both, but what're the good ingredients inside your lip balm? All of our hive lip balms are made with Bee's wax and organic ingredients such as organic palm oil, organic hemp seed oil (no THC), and organic virgin olive oil. We find these ingredients are better for us and the environment. Which lip balm flavor matches Loomstate’s Akan dress in pink best? I would have to say Summer Raspberry. It too…like the dress is made in the USA from natural ingredients. We imagine you've always got some Hive in your pocket. What're your personal favorite flavors? Morgan - If I was stranded on a deserted island and I could only pick one I would bring Coconut. Brian – Raspberry is always within my reach (night stand, car, desk, pocket….). Favorite beach to head to for a day of surfing? Morgan - I am in Oregon right now, but when I get back to Long Island I will be heading out to Long Beach. Brian – Ditch Plains on a quiet fall weekday. It is a long drive and doesn’t happen often for me, but when I can it is totally worth the trip! 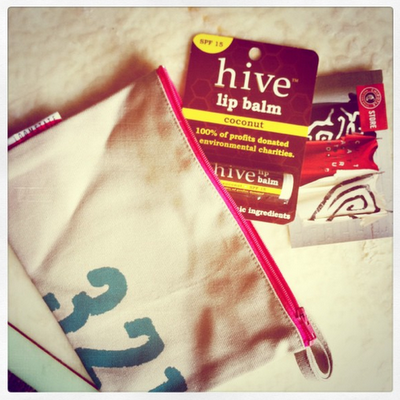 Where can we pick up some Hive lip balm and sunscreen? We sell hive lip balm in over 500 stores in 22 states. 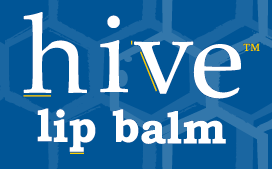 You can check out our website www.hivelipbalm.com for the one closest to you. 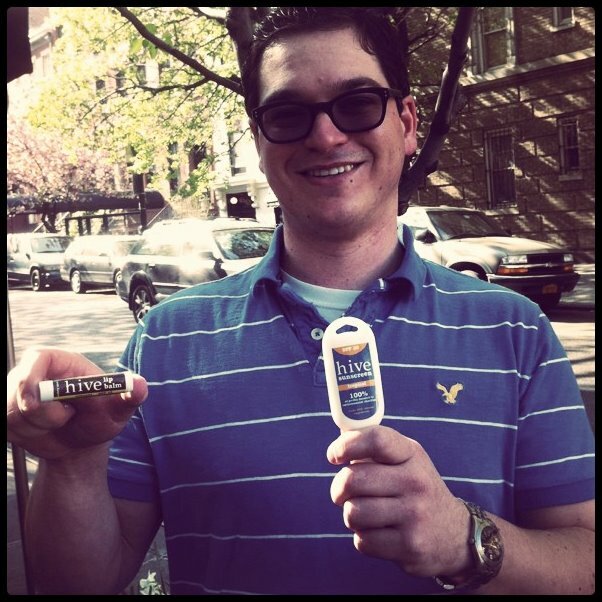 Brian + Hive lip balm and sunscreen in Soho!